PowerPlus Mouthguard, developed by a Traverse City dentist and manufactured in Gaylord, is the newest evolution of protective gear designed to maximize both the safety and performance of athletes participating in all sporting activities. The lower-jaw mouthguard is custom-fitted to provide targeted protection while placing the athlete’s jaw in the “power plus” position, which increases strength, athletic performance, and protects the brain from impact injury. “Results from a study on human subjects reported in the Journal of the Academy of General Dentistry showed the importance of placing the jaw in the optimal, physiologic position in order to drastically reduce the incidents of concussions,” says Michael Hutchison, founder and inventor of the PowerPlus Mouthguard. “Similarly, in an ongoing concussion field study that has grown to more than 4,000 athletes wearing the PowerPlus Mouthguard, results have shown the incidents of concussions reduced to 0.20 percent. PowerPlus Mouthguard, according to Hutchison, improves isokinetic strength in flexion, both for the upper and lower body, while placing an athlete’s jaw in an optimal maxilla-mandibular spacing that facilitates increased response time and balance. In addition, using physiologic jaw positions, g-forces that are normally delivered to the skull and the brain via physical impacts are ultimately lowered, reducing instances of dental injury and concussions. The mouthguard also allows athletes unobstructed breathing and the ability to speak clearly without compromising protection. 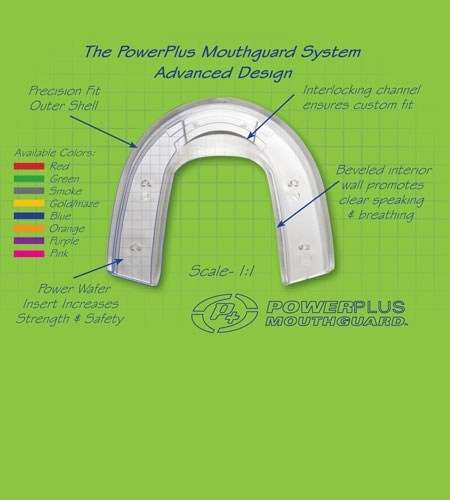 The effectiveness of the PowerPlus Mouthguard is directly related to the three-step, customized fitting of each piece. The mouthguard comes with a power plus position measuring gauge that measures an athlete’s unique bite position. After this position is determined, it is then locked in by heating the mouthguard in boiling water before placing the guard in the mouth to finalize the perfect, individualized fit.